Making air travel harder than it already is… why we’re tired of speculating about the impact of a corporate tax cut… an appreciative note from a cancer survivor… and more! “We are staring at a tsunami of Alzheimer’s disease,” says Keith Fargo of the Alzheimer’s Association. However you run the numbers, Alzheimer’s is now the sixth leading cause of death in the United States — and the fifth leading cause among people 65 and older. To some extent, the runaway numbers reflect the fact that science is getting better at combating other diseases of aging. “Over the past few decades, biotech and pharma research has made huge strides at reducing deaths caused by cardiovascular diseases,” points out FDA Trader editor Ray Blanco. “And every year, cancer gets a bit more survivable. “If you are married and between the ages of 55–70, there’s a 1 in 2 chance that one of you will get Alzheimer’s,” says Ray. “More than 5 million Americans have this disease, and it costs $226 billion per year to deal with its effects. The number of patients is set to triple over the next few decades, and the costs are expected to surge to over $1 trillion. “As you can imagine, the market demand for a new drug that can help with this disease is enormous. “The profit potential in a small biotech proving it has a drug that works, and marketing it, is correspondingly large,” Ray goes on. Ray is on the case of a company that’s giving a second chance to a treatment Big Pharma had abandoned. Its drug works by targeting a neurotransmitter in the brain. Results from Phase 3 clinical trials are due next quarter. “A positive result creates the potential for explosive gains for us,” he says. “Triple-digit gains.” FDA Trader readers will be first to know. [Ed. note: FDA Trader readers will also be first to know about progress on a groundbreaking tool that could transform the diagnosis of another killer disease among aging Americans — cancer. Gains of 10,000% are entirely within the realm of possibility. The major U.S. stock indexes are in the red on this first unofficial day of the market’s summer season — when the big boys are in the Hamptons and the junior traders are in charge. Both the S&P 500 and the Nasdaq are retreating from record closes reached last Friday. The S&P rests at 2,412. But the handful of big names that dragged the indexes higher this spring are in the green; indeed, Amazon shares crested $1,000 this morning for the first time. Gold is in retreat, and that’s despite some dollar weakness today; at last check the bid was down a quarter percent at $1,263. Crude can’t keep Friday’s bounce going; a barrel of West Texas Intermediate is down nearly 1% at $49.39. 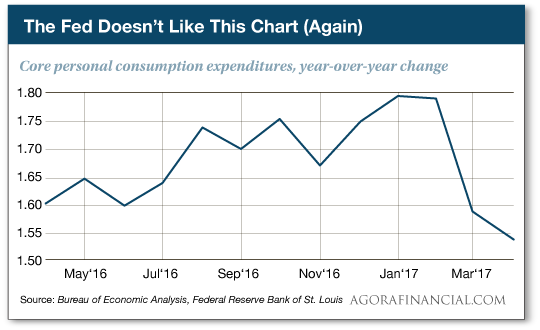 Inflation continues to move in the wrong direction, as far as the Federal Reserve is concerned. The Commerce Department is out this morning with “core PCE,” the Fed’s preferred measure of inflation. When the Fed talks about its 2% inflation target, this is the number it has in mind. No, it’s not enough to dissuade the Fed from another interest rate increase two weeks from tomorrow. In fact, the current 1.5% level is the lowest since December 2015 — when the Fed embarked on the current rate-raising cycle. The same Commerce Department report shows both consumer spending and personal incomes rising 0.4% in April. The savings rate has held steady at 5.3% for three months now. It’s happened again — another bump in cybersecurity stocks on the heels of a major attack. Two weeks ago today we were telling you about the WannaCry (alternatively WannaCrypt) ransomware attack, afflicting 230,000 Windows computers in more than 150 countries. “Every time an attack occurs, corporations and individuals start fretting about the next big attack,” says our small-cap specialist Louis Basenese by way of update — “and, in turn, start spending more on defenses. “Investors, wise to the direct cause and effect, anticipate the bottom-line impact for cybersecurity stocks by bidding up shares on news of fresh attacks. “And of course, the whole process repeats itself in the aftermath of each attack, which means it pays to be positioned beforehand,” Louis goes on. His favorite way to play it is the PureFunds ISE Cyber Security ETF (HACK). True to form, it leaped two weeks ago today… quickly retreated… and this morning is retesting those recent highs. Besides, there’s no shortage of individual names with massive potential in other technology niches. For access to his favorites, look here. We’re grabbing the popcorn to see how an “edgy” Goldman Sachs trade is going to turn out. As you probably know, Venezuela has descended from socialism into poverty. Inflation, per the Troubled Currencies Project at the Cato Institute, is running 440% a year. Street protests are a near-daily occurrence. With that in mind, Goldman spent $865 million last week for Venezuelan government bonds with a face value of $2.8 billion — that’s 31 cents on the dollar. And now a 5 business travel alert: Not content with a 16% year-over-year drop in foreign tourism (per a new analysis from Foursquare), the Trump administration appears determined to make business travel just as undesirable. Over the weekend, Homeland Security Secretary John Kelly said he’s thinking about banning laptops in carry-ons on all international flights. That would build on a decision to ban laptops in the cabin on flights from 10 airports in the Middle East and North Africa. “Where exactly is this money being stored? In corporate bank accounts at local banks, such as Deutsche Bank or the troubled Italian banks which have been mentioned in Agora publications in the last few months. The 5: You’re not the first person to pose the question. At this time, we don’t have a great answer. And to be honest, we’re not going to invest a lot of research trying to come up with an answer until it looks as if corporate tax reform has a prayer of passage. Which at this time, it doesn’t. “GOP Bid to Rewrite Tax Code Falters,” says a front-page, above-the-fold headline in today’s Wall Street Journal. And the Journal story didn’t even bring up the hand grenade the White House tossed Congress’ way last week, asking for the debt ceiling to be raised before the end of July because tax receipts are currently falling short of projections. “Your response to the question of why bringing home the dollars won’t necessarily boost inflation was one not often discussed — Corporate America’s fear of what the government might do next. “I run a small business, and the fear of what the government may do in the near future prevents me from making any long-term commitments. Business owners are not much different than investors: When fear and doubt are at the forefront, we all turn to cash, we don’t spend. I have watched the last 10 years very intently and have found that no one company or business can say they are immune from what the government does. “Donald Trump has been president now for five months, and it is my hope he and Congress can provide some sense of stability for not just small-business owners, but the large ones as well. Perhaps then Corporate America may start reinvesting in America again. “I was delighted to hear of the advances in the electromagnetic head wraps to treat glioblastoma,” a reader writes after Friday’s 5. “I am a very rare survivor of the disease, as the hard data of survival rates are closer to 5% — depends on who you source. Big Pharma that sells the current poison, called Temodar, quotes higher rates (false advertising) in order to convince dying people to spend thousands on a poison that is NOT even proven to break the amazing blood-brain barrier. “I have personally experienced the full ‘slash, burn and poison’ barbaric ‘treatment.’ I attest that the current mainstream treatments of chemo and radiation are worse than the disease itself! I’ve read about several different electromagnetic treatments that don’t kill the person before the disease itself does. Thank you for bringing recommendations about critical lifesaving treatments that nobody is talking about. “One of the main reasons I joined Agora was to learn how to invest in cannabis markets, as cannabis oil — high in CBD — is what saved my life. In fact, I never started getting better until I kicked the poison to the curb and legally acquired cannabis oil (and remain on a maintenance dose). I have no doubt that the future of cancer treatments, as well as many other disease treatments, will be found within the cannabis market. “Cancer is not getting beat. It’s gaining ground — that latest reports suggest that 50% of individuals within Western societies will experience the wrath of some type of cancer in their lifetime. This is not just a battleground… it is one of the largest future markets. The 5: We’ll be sure to pass along your kind words to Ray Blanco. P.S. Last chance: Our presentation on one of Ray Blanco’s breakthrough cancer recommendations — a diagnostic tool that could truly change everything — comes offline tonight at midnight. If you want to watch, now’s the time.